For most of us, wrinkles are just a part of natural aging. However, according to Web MD, there are other contributors as well. 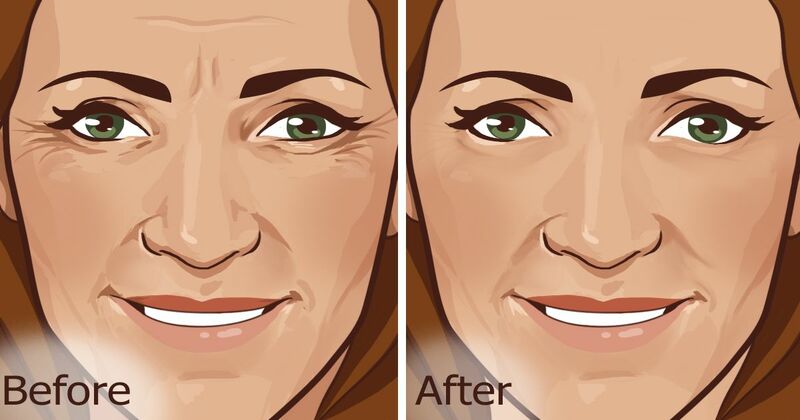 Those deep “11” wrinkles that form on your forehead and the branch-like creases near the eyes become more prominent by habitual muscle contractions. Smiling, frowning, and squinting can make them more noticeable. Other things such as sun exposure, skin care, and heredity can also play a role in development. While wrinkles can be proof of a life well lived, many of us want to limit just how obvious that evidence is. If you are looking to soften and reduce the appearance of wrinkles, read on for a few natural remedies. Exercise 2: Make a prominent kissing face where your mouth is nearly touching your nose. Hold for 2 seconds. Exercise 3: Pull your lips forward and downward holding for 2 seconds. Repeat this cycle 20 times to stretch and strengthen your facial muscles. This targets deep lines around the mouth. Who doesn’t love a great massage? The circulation motion helps to keep proper circulation which in turn leads to strengthened and tightened skin. Simply massage your face in slow circular motions. Take care massage your most troubled areas including your neck. The improved blood flow will help reduce the appearance of wrinkles and prevent the development of new ones. According to an article found on Natural Facial Cares, simply using ice on your face can greatly improve deep wrinkles. Again, this improves circulation which makes it difficult for the skin to loosen and crease. To use, rub a small ice cube around your face 15-20 seconds. The cooling effect will not only feel great, but it will also rejuvenate stagnant skin. Aloe vera is a simple yet effective remedy. It works to moisturize skin which can delay the formation of wrinkles. Simply apply the gel from the plant to the face. Allow it to soothe the skin for 10-15 minutes before rinsing. According to Medical Daily, the banana does many great things for the skin. The vitamin A helps reduce the appearance of dark spots; vitamin B works to prevent aging, vitamin E protects against harmful UV rays that can lead to wrinkles, and the potassium hydrates skin. Simply mix one mashed banana with a teaspoon of orange juice and a teaspoon of plain yogurt. Apply to the face and allow it to set for 20 minutes before rinsing. Natural Facial Cares indicates that egg whites are a good option for battling wrinkles. Egg whites work to tighten the skin temporarily, and regular application can help reduce the appearance of sagging skin. All you've got to do is apply the egg whites to the wrinkled areas and wait until it dries before removing. Take care to use a moisturizer as overexposure can lead to dry skin. Do you or someone you know have wrinkles? Share these natural remedies.